One of the most well-known cities in New Jersey, Hoboken is considered part of the New York City metropolitan area and it has a rich and storied history. Once the home of Frank Sinatra and the location of the first game of America’s pastime, baseball, Hoboken has a cultural history as diverse as the residents and businesses who call this city home. If you are planning a move to, within or from the Hoboken area, contact the expert northern New Jersey moving company - Booth Movers! Since 1945, we have been providing high quality Hoboken moving services that focus on the satisfaction of our customers. Our commitment to customer-oriented services has earned us accreditation and an “A+” rating with the Better Business Bureau, as well as the title of ProMover with the American Moving & Storage Association. Whether you are moving a two-bedroom apartment or an industrial warehouse, Booth Movers has the northern New Jersey movers you can trust for an easy and efficient relocation! Residential Moving: No matter what type of residential moving services you need, our professionals have the required training and knowledge to execute your move easily. Household Moving: With our access to the most advanced equipment and professionals in the moving industry, we can ensure that your household move is smooth and seamless. Local Moving: Local moves may not require extensive traveling, but they still come with unique challenges. Let our Hoboken movers eliminate stress by doing all the heavy lifting for you. Long-Distance Moving: Long-distance moves can be completely overwhelming, but not when you have Booth Movers at your side. Interstate Moving: Our affiliation with Atlas Van Lines allows us to perform interstate moves easily and efficiently. Full-Service Moving: You don’t have to worry about a thing when you choose our impressive full-service moving options. International Moving: Take the anxiety out of your international move by selecting the qualified and capable professionals at Booth Movers. Commercial Movers: When you need professional Hoboken commercial movers with a reputation for reliable, full-service solutions, you will be glad to discover Booth Movers. Specialized Movers: When moving expensive equipment, fine-art, pianos, or other delicate and difficult-to-move items, Booth Movers has the solutions you need! 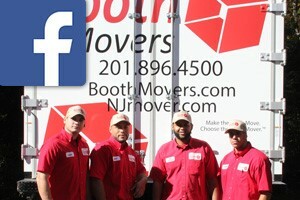 Ready for more information on what makes Booth Movers the leader among Hoboken moving companies? Contact us today! Call to discuss your upcoming relocation with one of our friendly and knowledgeable moving specialists or complete our convenient online quote form to request your free estimate right now.